TV: NBC Sports Chicago: Neil Funk and Stacey King. 9 PM CT tip. RADIO: 670 The Score: Chuck Swirsky, Bill Wennington and Steve Kashul. 8:45 CT pre. LEADING SCORERS: Bulls: LaVine - 23 ppg. Utah: Mitchell - 21ppg. LEADING REBOUNDERS: Bulls: Markkanen - 7 per. Utah: Gobert - 12 per. 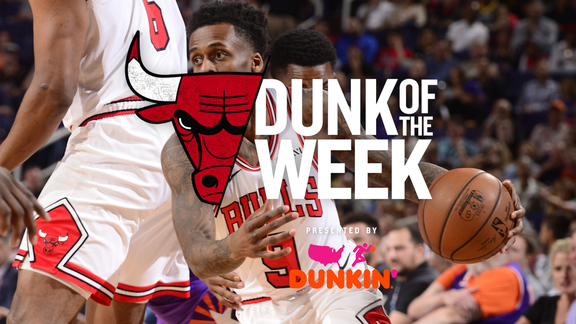 LEADING ASSISTS: Bulls: Dunn - 6. Utah: Ingles - 4. CCI PREVIEW: The Jazz get the Bulls in the second game of a home/home back to back after taking care of business against the Lakers last night, 113-95. Donovan Mitchell is starting to heat up scoring 33 points in each of his last two games. He is extremely gifted and has an incredible upside to his game. Rudy Gobert is a menacing shot blocker and rim protector. The Jazz are banged up but they are a gritty team with Favors, Crowder and Ingles not afraid to get down and dirty. The Bulls can't afford to get behind early, as was the case last night against the Warriors. Utah has been a mild disappointment in the West, but they’ve played seven more road games than home. If they expect to move up in the standings in the Western Conference, they must do a better job than a current 10-8 mark in SLC. They’re showing signs of turning the corner having won four of its last five games. LEADING REBOUNDERS: Bulls: Hutchison - 6. Golden State: McKinnie - 8. CCI RECAP: Klay Thompson drilled his first three shots, all from three point range and that was it. The Bulls never recovered as Golden State led wire to wire. The combo of Thompson, Curry and Durant combined for 80 points. Golden State out rebounded the Bulls by 20. Utah 113, Los Angeles Lakers 95: The Utah front court of Ingles, Favors and Gobert combined for 41 points and 43 rebounds. Donovan Mitchell scored 33 and dished out a career high 9 assists. Atlanta 123, Philadelphia 121: Kevin Huerter, the sharp shooter from Maryland drilled 5 threes, tossing in 29 points for the 13-29 Hawks. Ben Simmons 23-10-15. For the second time this season, Simmons called his team “soft”. Joel Embiid sat out with an ankle injury. Washington 113, Milwaukee 106: The Bucks played without Giannis (hip/quad). The Wizards' Tomas Satoransky recorded his first triple-double with 18-12-10. Washington tied a franchise record with 18 made 3s. Indiana 121, New York 106: Domantas Sabonis with a robust game of 22 points and 15 rebounds. In two games against the Knicks at MSG, Sabonis is 21 of 26 from the floor. Toronto 122, Brooklyn 105: The Raps are on a roll...now 32-12. Toronto is 18-4 at home. Houston 141, Cleveland 113: Harden: 43-10-12...in three quarters. It was his 15th straight game with at least 30 points. Dallas 119, Minnesota 115: Luke Doncic 29-8-12 spoiling rookie coach Ryan Saunders' home debut. Portland 127, Charlotte 96: McCollum and Lillard combined for 50 points through three quarters. The Hornets have not won in Portland since 2008.